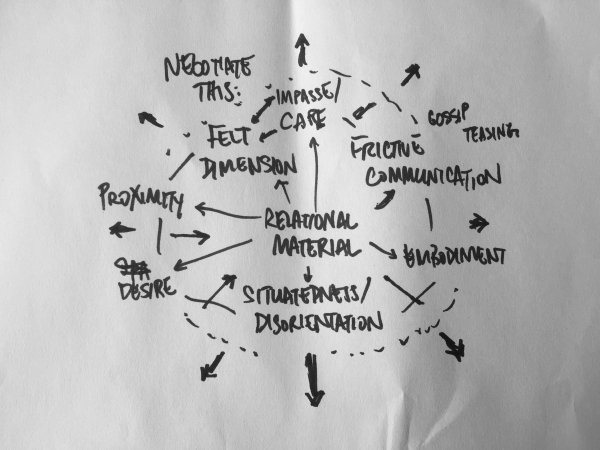 My funded doctoral research argues for a socially negotiated art as an embodied practice. It centres the making, maintaining, and critiquing of relations in artistic processes. So: what does it feel like to produce art beside others, in the social realm? There are all kinds of friction, contradicting feelings, and uncertain boundaries (but boundaries nonetheless). Rather than reiterate their artistic or political merit, I describe the actual work of socially negotiated art and craft a different critical language around it. This has been greatly helped by studies steeped in the thick of lived experience, including queer, feminist, and affect studies. Please get in touch if you would like to know more. A bite-sized zine version of this is also in the works so stay tuned!